Our club has been a proud part of this community and of Rotary International since 1926. Rotary is a global network of more than 1.2 million members who believe that great things happen when dedicated minds come together. We are community and business leaders representing different professions, experiences, and perspectives but with a shared desire to connect with others to address the challenges affecting our community and communities around the world. Camp Tidnish. The Club sponsors approximately 20 mentally and physically challenged youth from our area to attend this barrier-free summer Camp. 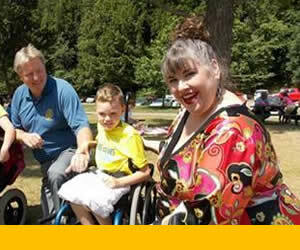 The Camp is owned by the Rotary Club of Amherst and operated by Easter Seals Nova Scotia. Additionally, we financially assist improvements to Camp facilities. 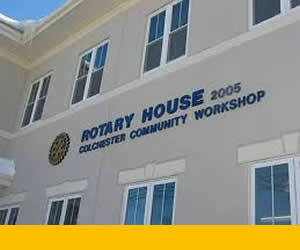 Colchester Community Workshops (Rotary House). We made a significant donation for the construction of Rotary House and provide on-going hands-on support towards operating this facility. In addition to being the primary sponsor of the Workshops’ major fundraiser, club members serve as directors on the Workshop and Foundation boards. Colchester Christmas Index. 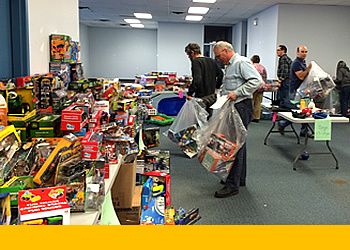 The club operates the Christmas index program each year in Truro. The Index provided toys and food hampers from the Food Bank for over 110 families and mare than 200 children for Christmas 2017. Interact. The club sponsors Interact Clubs at the Cobequid Educational Centre and at South Colchester Academy. Adventure in Citizenship. Each year the club sponsors one student to attend the Rotary Club of Ottawa’s Adventure in Citizenship. Five bursaries are awarded to local grade 12 students to further their education. The Club supports an annual $1000 bursary to International Students at the Dal AC. Rotary Youth Leadership Award Conference. We sponsor and organize an annual one-day seminar on leadership for high school students in the Colchester and East Hants area. $500 bursaries are also offered to select participants. International Development. The club provides assistance to students/community groups to offset costs associated with projects in developing countries (e.g. books, medical supplies, Stanfield’s underwear, food safety and nutrition information). We have also assisted directly by supporting projects that have provided for latrines and the rebuilding of a school in The Cameroon; medical equipment for Haiti and contributions to a local church’s Guatemala Outreach project. Polio Eradication. The Club and individual memebers provide funding to Rotary International to continue to combat Polio. Rotary has been involved in this fight for decades (recently in partnership with the Bill & Melinda Gates Foundation and WHO). As the major not-for-profit organization in the endeavour, Rotary is committed to eradicating polio. Polio vaccine is purchased and Rotarians often volunteer to serve on the vaccination teams to administer immunizations to children in emote and often war-torn areas of the world. The Rotary International Foundation. Member and Club funding is provided to our worldwide Foundation. This money is often "matched" and used for disaster relief and humanitarian projects in less fortunate countries. Rotary International oversees the distribution to ensure maximum effectiveness. Medical Assistance. Our Club provides thousands of dollars annually of financial assistance for specialized medical treatment, adaptive equipment or other costs (not covered by MSI or private insurance) to local residents who are in need. Becoming a member enables you to meet your community’s leaders and to make an impact both here and around the world. We invite you to visit our club and find out more about us and the opportunities we offer to get involved. Our members have found that it’s a truly rewarding experience.